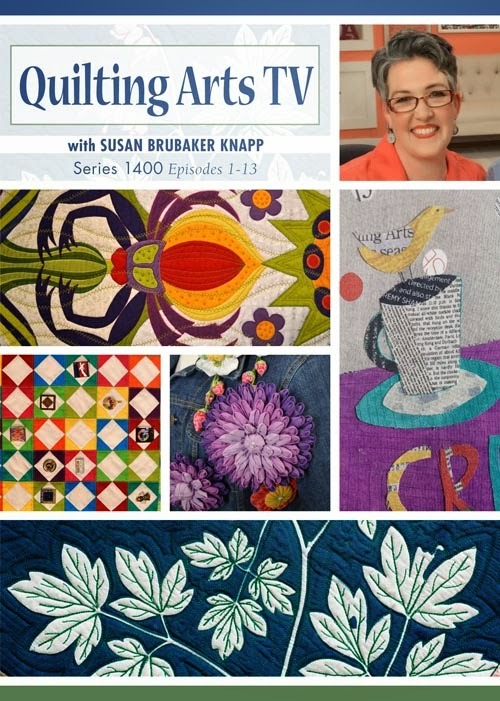 QATV Series 1400 now available! Woo-hoo! It's here! 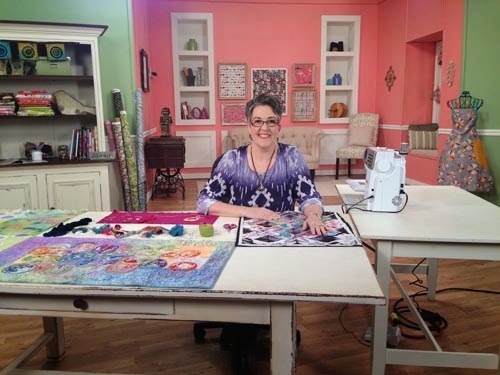 You can now get the entire 13 episodes of Quilting Arts TV Series 1400 (the first series on which I am host) on the Interweave Store. It is available as a DVD ($39.99) or download ($34.99). 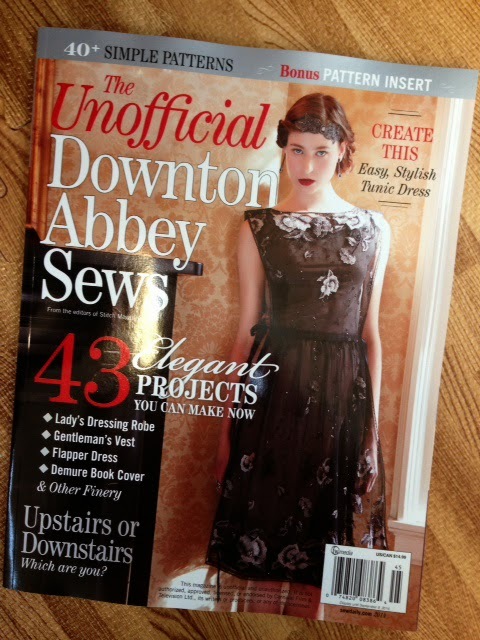 Both come with a bonus section where I show how I quilt vintage linens. 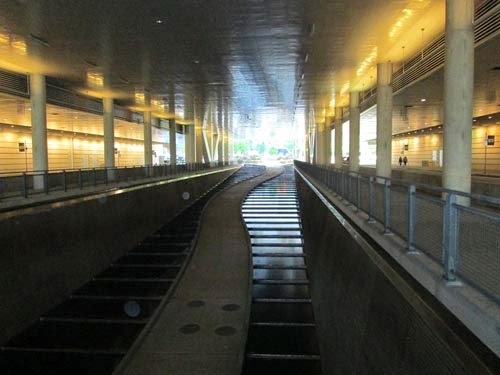 Shows will start airing on about 400 public television stations in the U.S. in late July. Stay tuned! 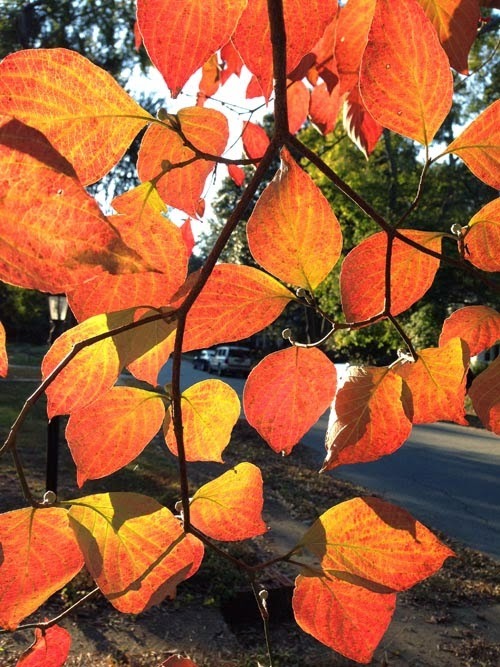 I loved the colors in the leaves, but wasn’t as crazy about the background, and decided to change it to a clear blue. I used a piece of fabric I had hand dyed, which is blue mottled with a darker blue-purple. 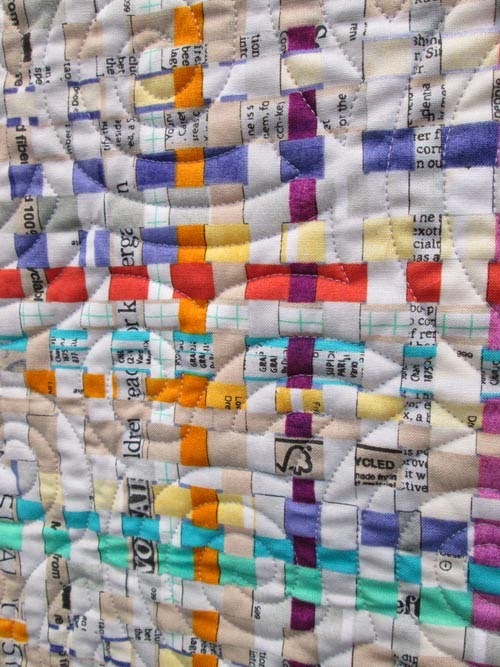 I made this piece to illustrate an article I am writing for the October/November issue of Quilting Arts magazine in my threadsketching series. 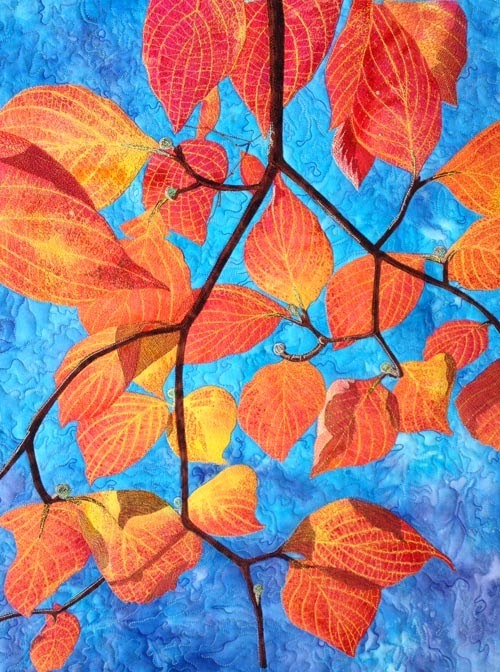 I really love how the oranges and yellows in the leaves are playing with the blues and purples in the background. QATV Series 1400 is almost here! I have to say that it is extremely weird to watch yourself on TV. 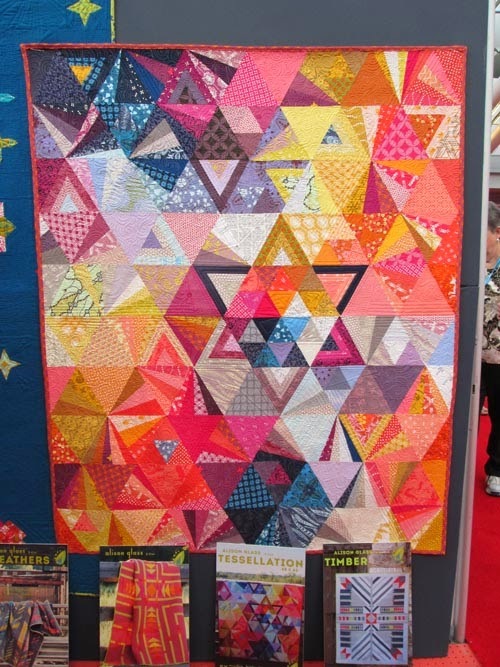 When I get the series on DVD, I’m thinking about having a viewing party so that my local quilt friends can mock me. But I’m very excited to share with you the many talented guests in this series. 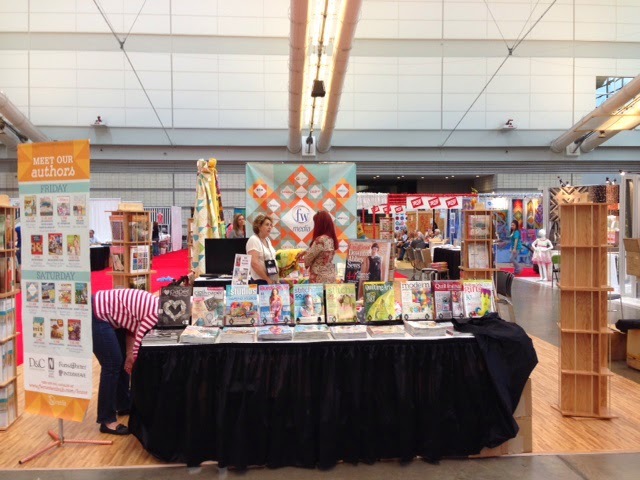 I loved talking to them and learning from them… and you will, too! 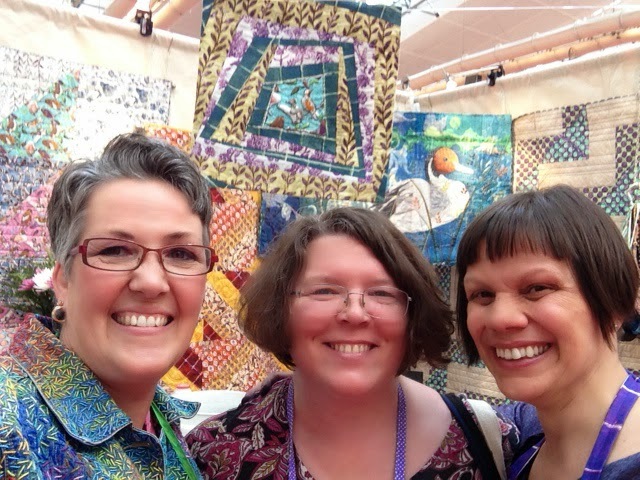 Welcome to the first stop on the blog hop celebrating Cheryl Sleboda’s brand new Quilting Arts Workshop! 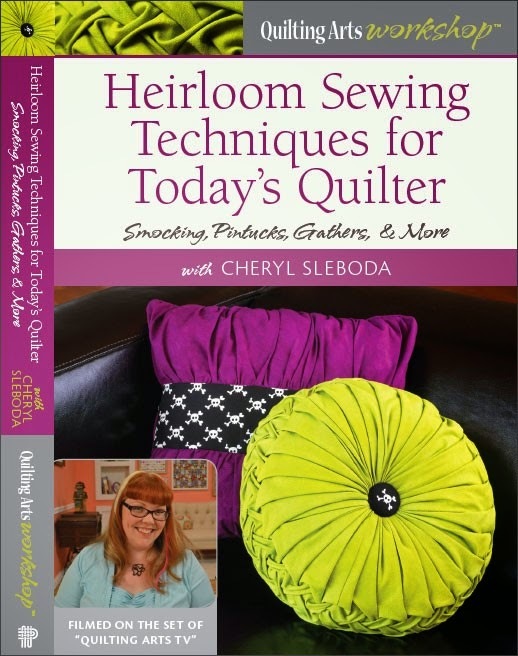 It’s called “Heirloom Sewing Techniques for Today’s Quilter: Smocking, Pintucks, Gathers & More.” The 76-minute workshop is available in both DVD and digital download. 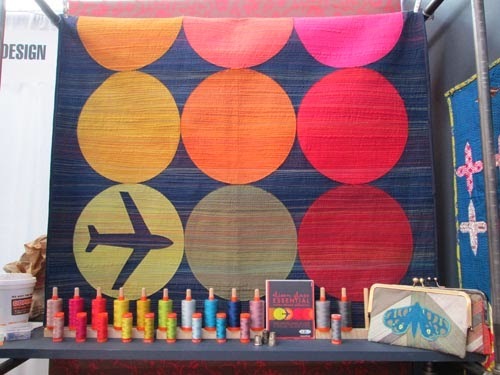 Cheryl is a fiber artist who loves to manipulate fabric; she also has found cool ways to light up her work with LED lights. 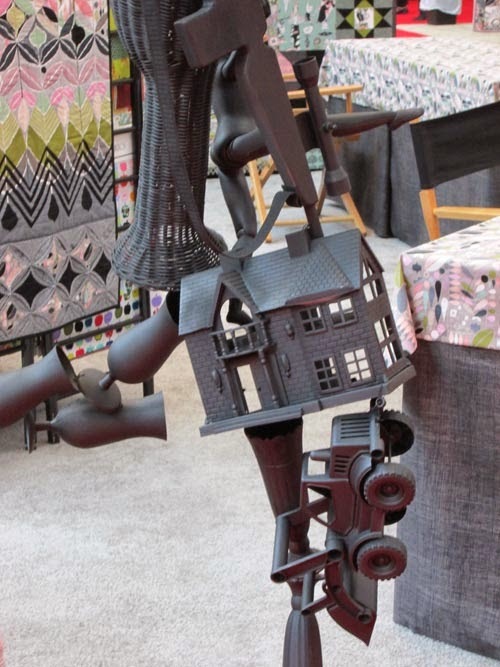 She uses heirloom dimensional fabric manipulations like smocking, pleating, or tucking; and cutting-edge technology like LEDs, microprocessors, or circuitry to create unique fabric art. 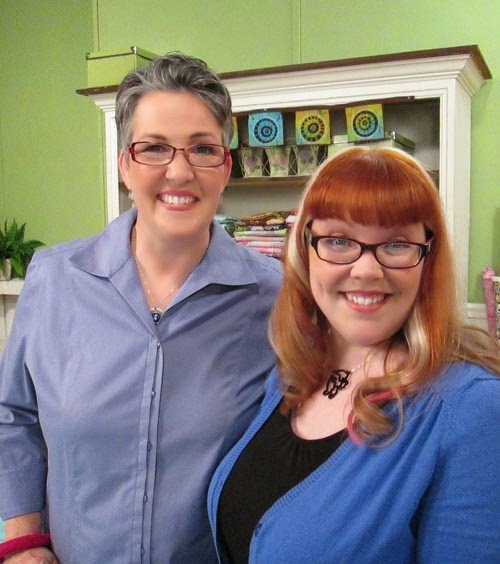 I first met Cheryl last year on the set of Quilting Arts TV, and then again this March, when I was hosting for the first time. 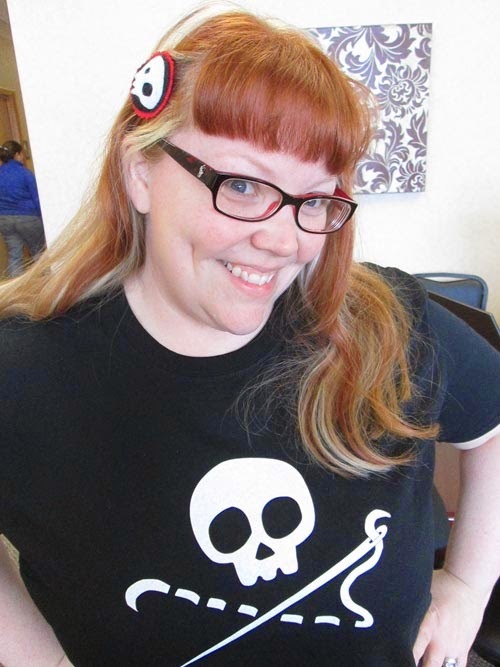 Cheryl works in the comic book industry, where she attends lots of Comic Cons (short for Comic Conventions) and meets some pretty interesting characters. 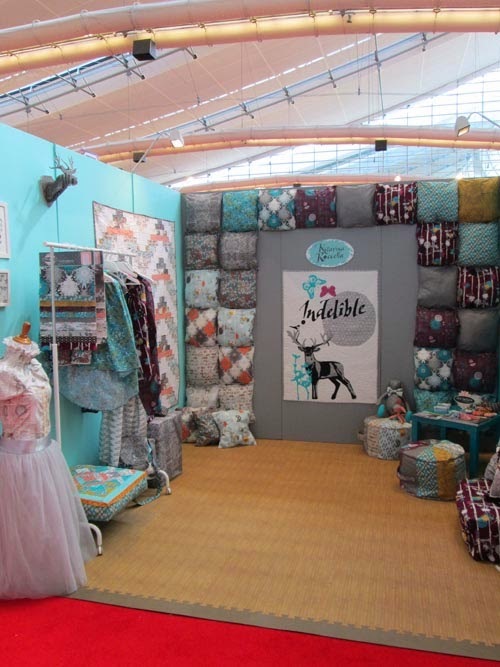 For fun, she makes innovative fabric art. I have to admit that these techniques were all completely new – and mysterious and somewhat intimidating – to me. But by the end of watching Cheryl’s DVD, I felt certain that I could do them successfully. 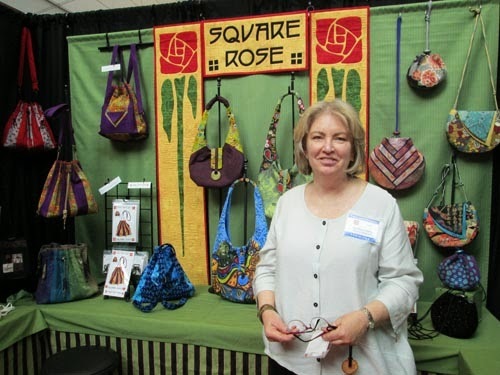 In the first section, Cheryl introduces viewers to the materials needed for the techniques. 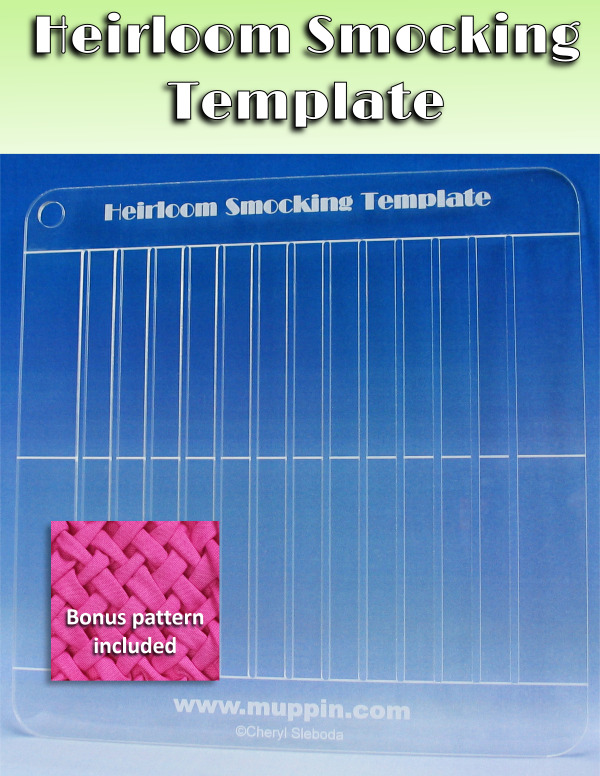 She’s developed a special grid called the Heirloom Smocking Template (available on her Etsy shop) to help sewers draw a smocking grid more quickly. 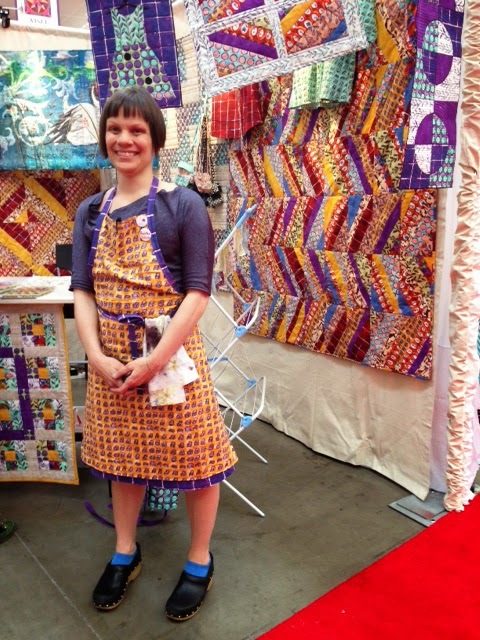 She discusses fabrics and threads, rulers and templates, hand needles, pins, and feet. 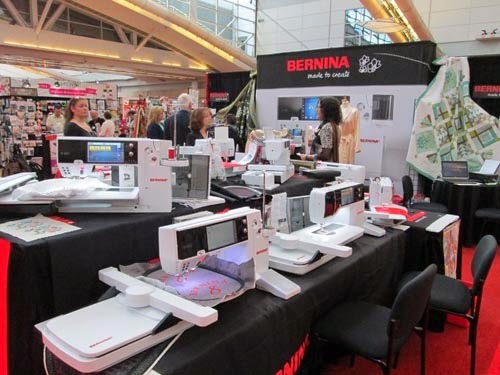 Next, Cheryl covers sewing in circles. 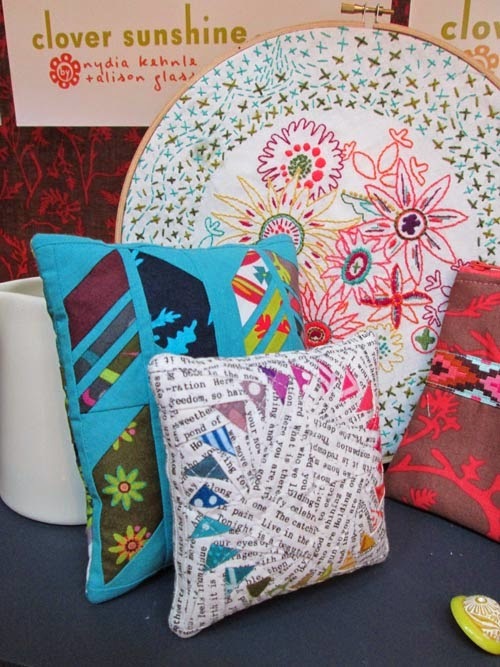 She draws patterns of circles on fabric, then hand stitches in a running stitch around each one, pulls it up and knots it to create five variations: puff, petal, pancake, pompom or pucker. 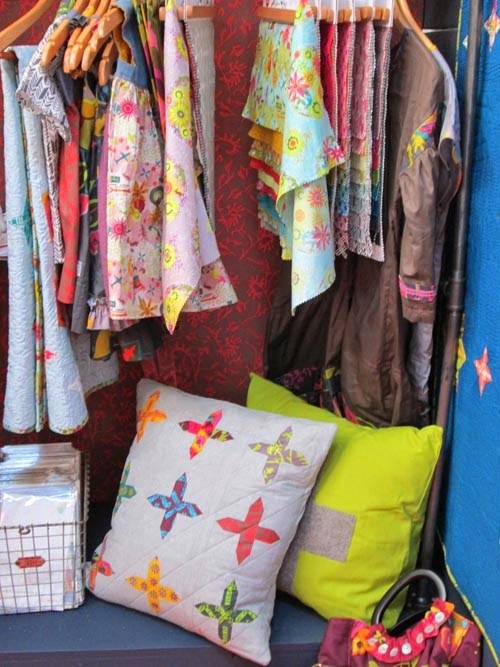 These make beautifully textured and dimensional patterns. 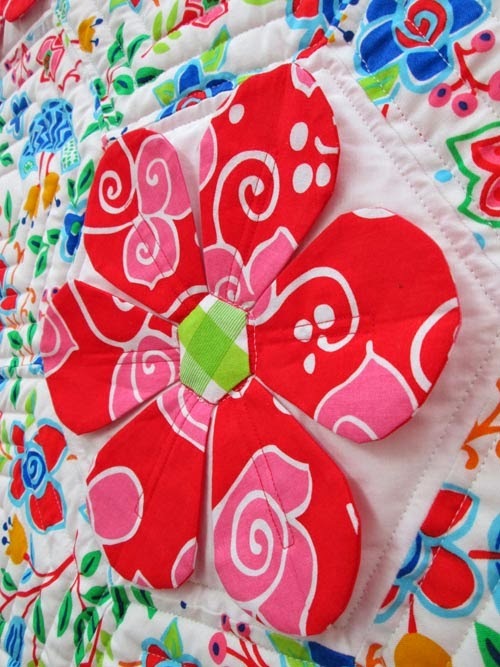 In the fourth section – Gathers, Puffs and Flowers – she demonstrates how to adjust tension and stitch length to create gathering effects that makes the fabric scrunch up. 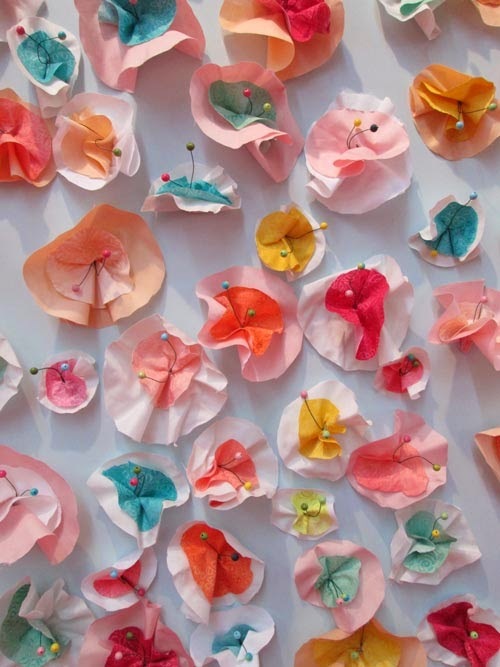 Gathering along a long strip (hemmed on one side) and rolling to create a rosette. She goes on to explore pleats and pintucks in the next two sections. 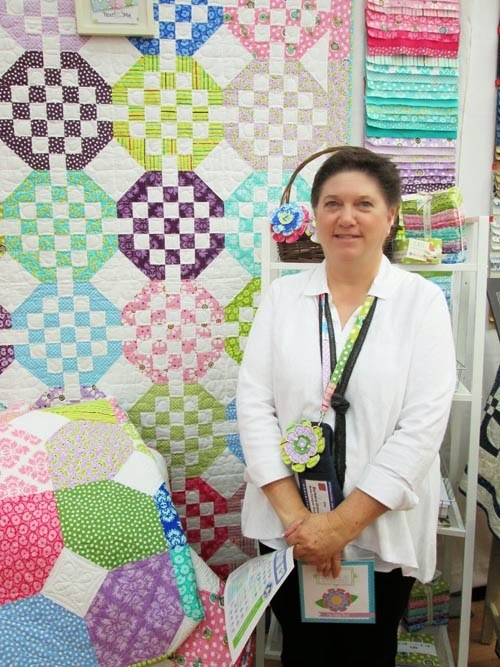 Creating pintucks was a mystery to me, but Cheryl clearly demonstrates how to select and use pintuck feet. 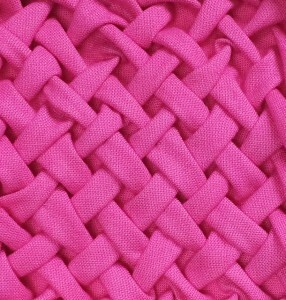 They come in different widths, and you have to select the correct size of double (or “twin”) needle to match the foot. 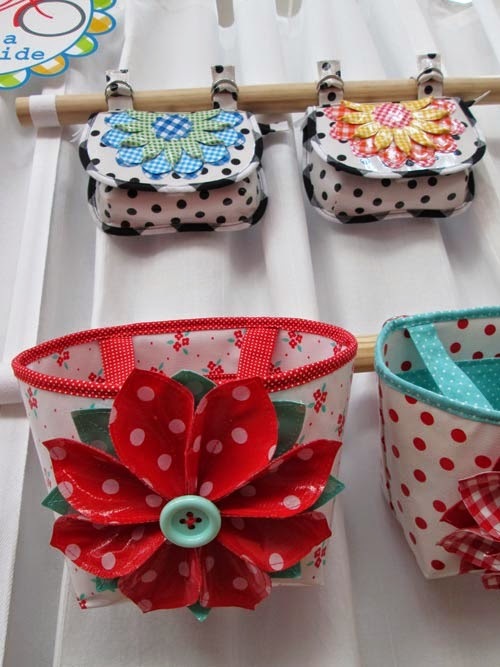 She shows you how to use cording to stuff a pintuck. 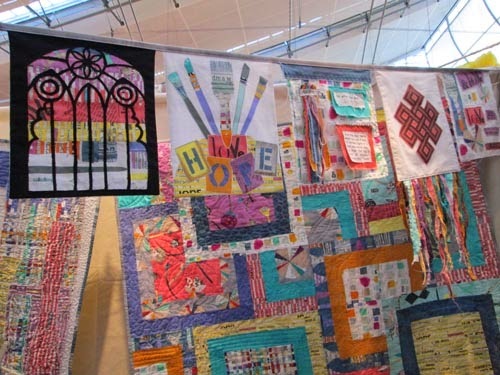 At the end, Cheryl talks about how to approach sewing these dimensional pieces into a quilt. 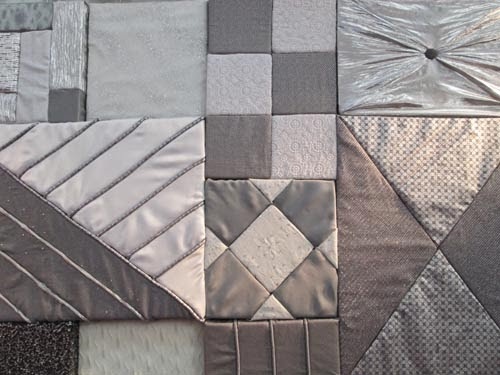 This requires explanation because the techniques pucker and draw up the fabric, so it has to be stitched down and squared up before it is trimmed. 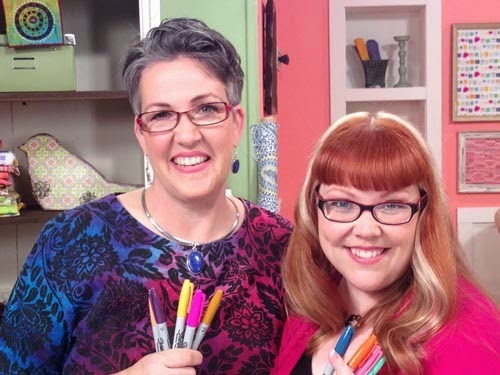 Then she uses some of her beautiful work to demonstrate how to use the dimensional, textured pieces you can create with the techniques from her DVD. 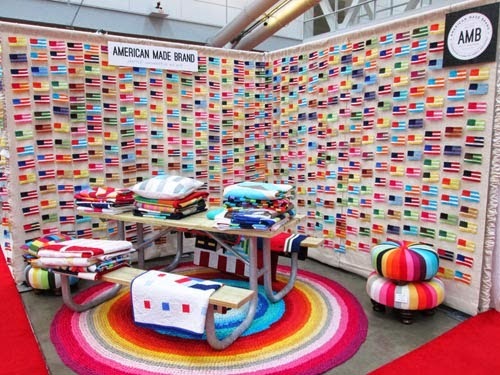 They include blocks for quilts, garments, samplers, pillows and entire quilts. 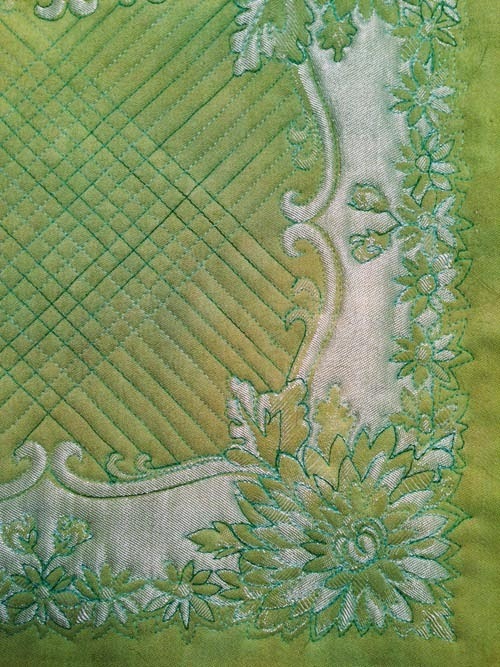 The techniques in this Quilting Arts Workshop were completely new to me. I feel like I’ve learned some new tricks to put into my repertoire; they just might show up in future projects! Cheryl is a great teacher. Her calm, step-by-step approach makes these techniques easy for anyone to learn. 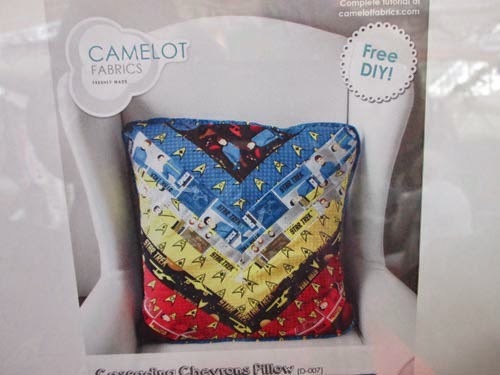 You can buy Cheryl’s new DVD, her “sewing skull” merchandise – t-shirts, tape measures, mugs – as well as her Heirloom Smocking Template and other goodies, on her Etsy shop. 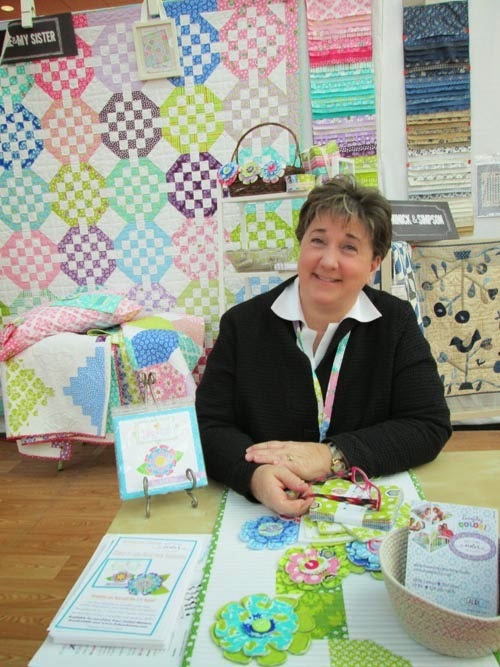 From the Quilting Daily Shop, you can purchase a copy of the DVD for $24.99 here, or a digital download for $19.99 here. 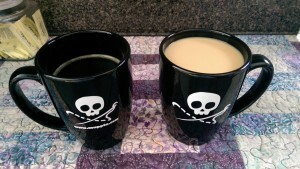 Here are all the stops on the blog hop. 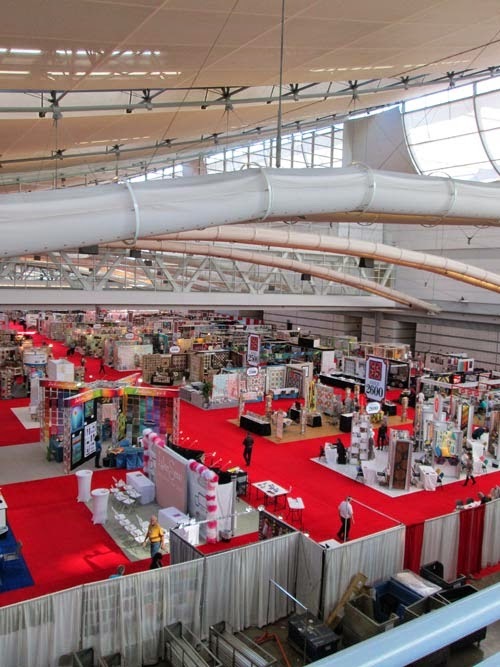 Come along and post comments for a chance to win fun stuff! We have a winner! BeckyPB won. Thanks for reading, everyone. 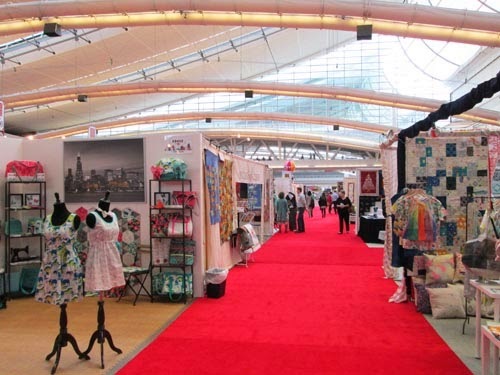 Spring Quilt Market was held a few weeks ago in my hometown, Pittsburgh, Pennsylvania! 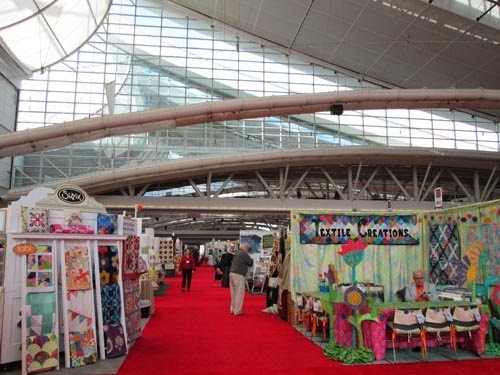 I was there for “Quilting Arts TV,” to meet with sponsors and seek out new talent. Here are some of the things that caught my eye. 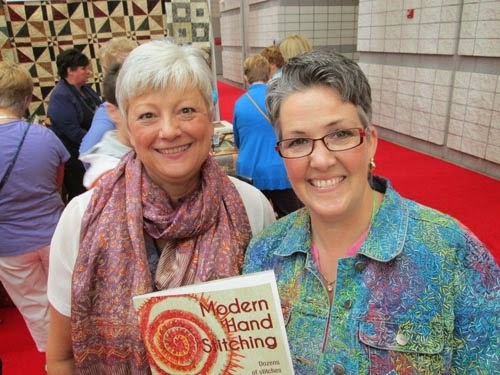 Ruth Chandler of Textile Evolution has a new book out called Modern Hand Stitching (Landauer) that is a fabulous resource for those who want to delve into contemporary hand embroidery. 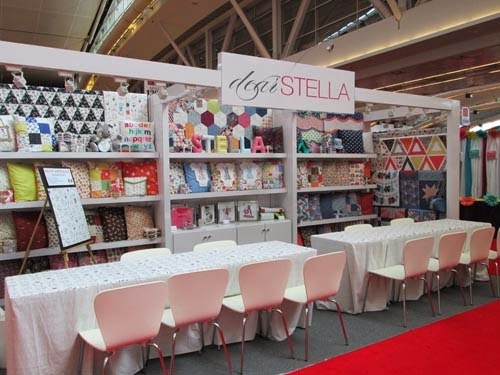 It has large photos that clearly demonstrate how to create each stitch, and fabulous gallery shots of what you can do with those stitches. 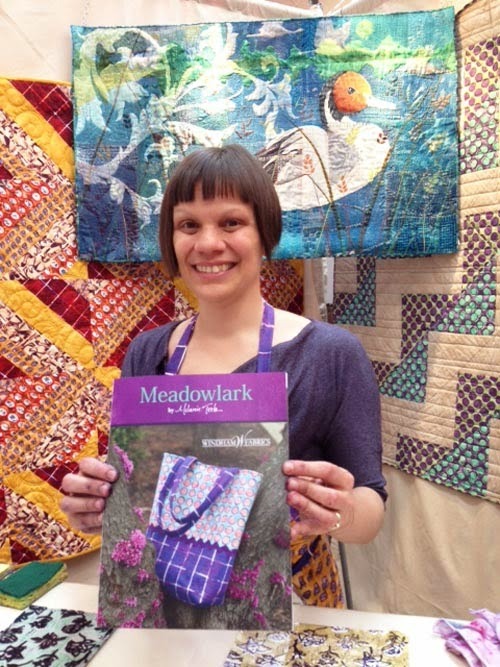 Melanie Testa was printing in her booth, and launching her first fabric line, “Meadowlark,” with Windham Fabrics. It is beautiful! 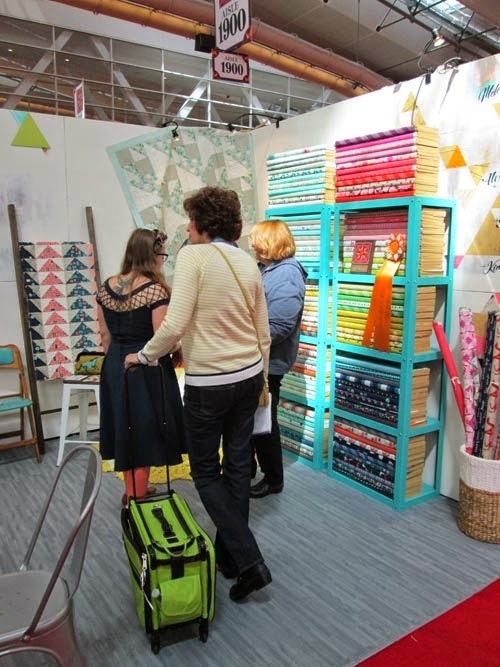 Linda Poole (left) and Sherry Rogers-Harrison were doing demonstrations in The Warm Company’s booth. They have been teaching together recently. 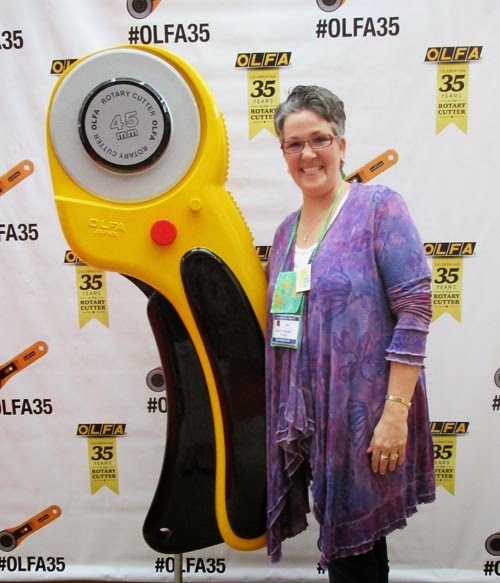 Sherry is a professional longarm quilter known for her coloring techniques called Ink-Liqué and Paint-Liqué. 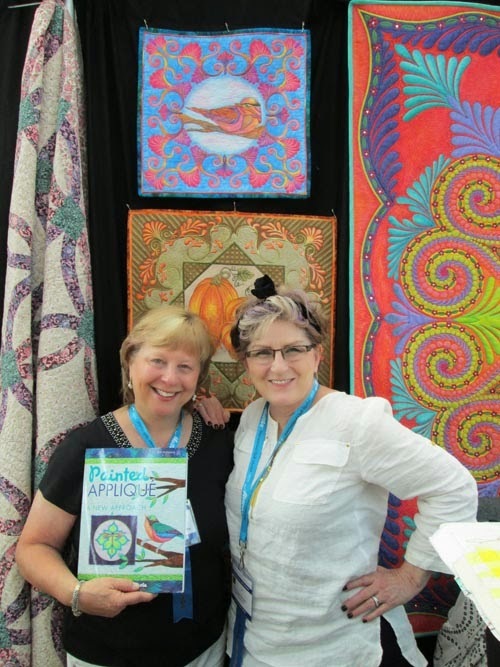 Linda has a new book with AQS called Painted Applique: A New Approach. 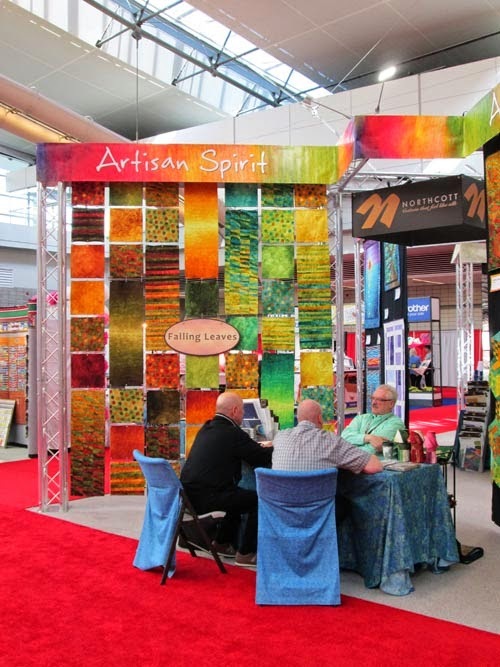 psssst… if you’ve been waiting for the return of The Warm Company’s Steam-a-Seam 2 or Lite Steam-a-Seam 2 (the fusible adhesive that works best for my fusible appliqué technique), it sounds like they may both be available later this year! I can’t wait, as my stockpile is running low. There’s an update on their website here. 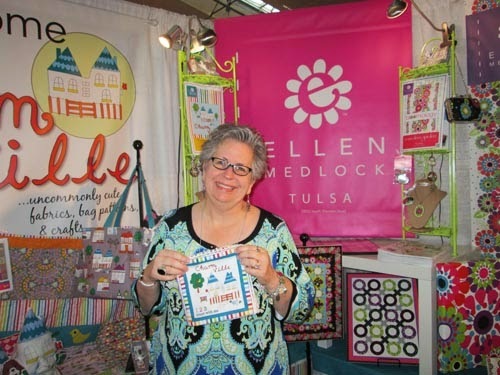 Ellen Medlock has some new fabric line with cute little houses called “Charmville” that is, well, simply charming! 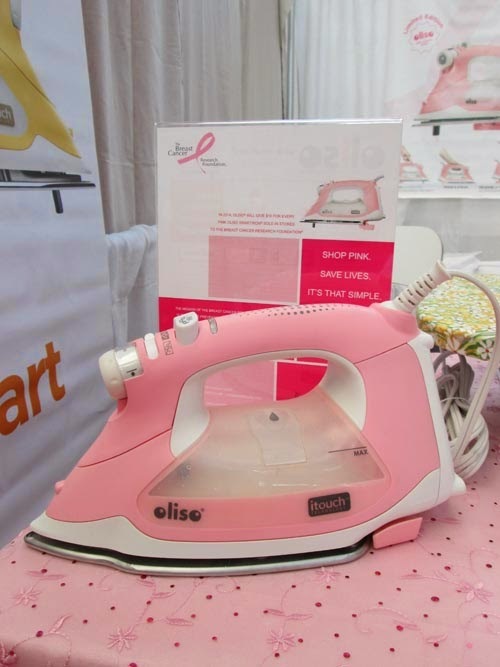 Oliso is coming out with this limited-edition darling pink iron in July. For every purchase of the TG1100 pink, Oliso will donate $10 to the Breast Cancer Research Foundation. 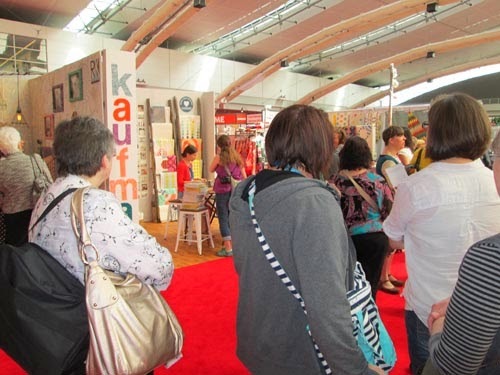 Most of the time, the floor was busy with quilt shop owners and other industry professionals. 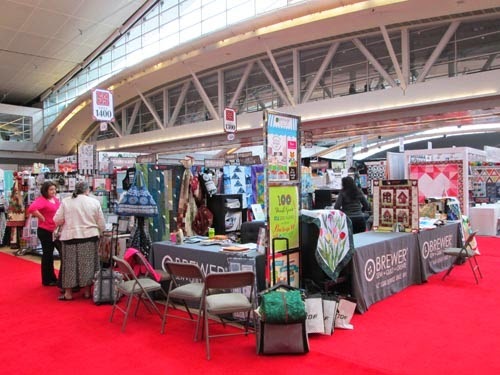 The credentialing process was tightened up this year, and the event was only open “to the trade.” Most of the vendors I spoke to were pleased with this, and said that orders were up at this Quilt Market. 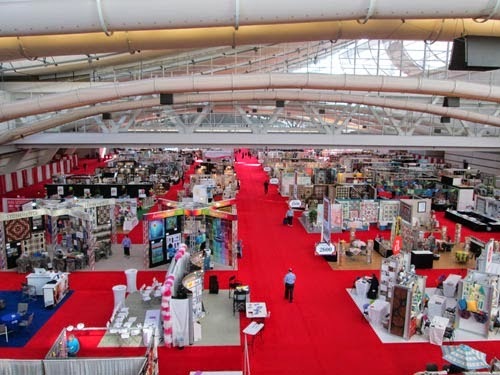 The David L. Lawrence Convention Center in Pittsburgh is a great venue for Market. 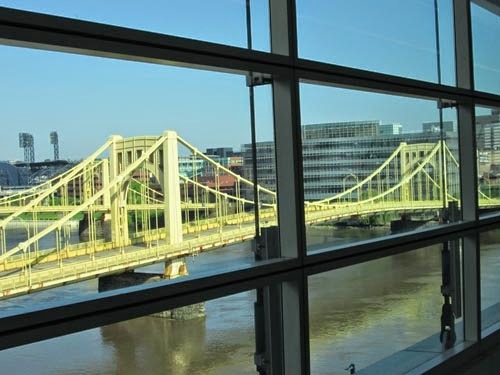 Pittsburgh (and it’s spelled with an h, folks!) 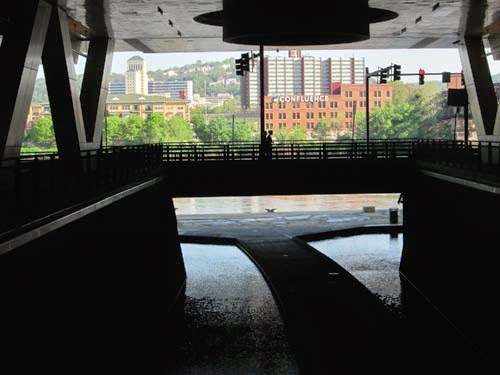 is where the Allegheny and Monongahela rivers meet to form the Ohio River, and the convention center pays homage to that, both with some beautiful waterways and fountains on the ground level, and with spectacular views on the Allegheny River upstairs. 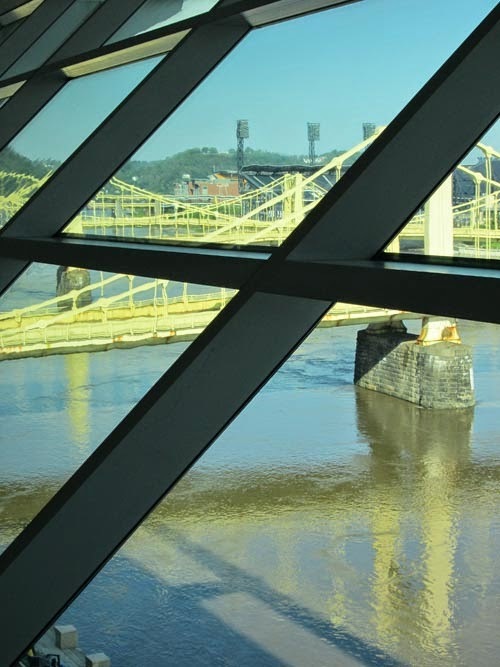 The structures in the ceiling inside echo the shapes of Pittsburgh’s many bridges. 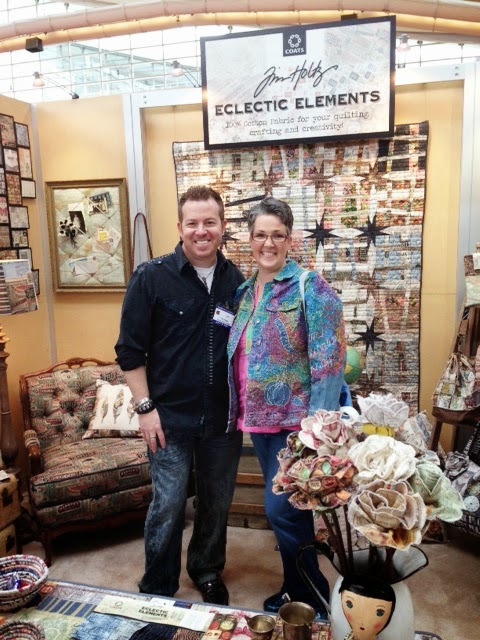 Mixed-media star Tim Holtz was at Market with his “Eclectic Elements” fabric line with Coats. 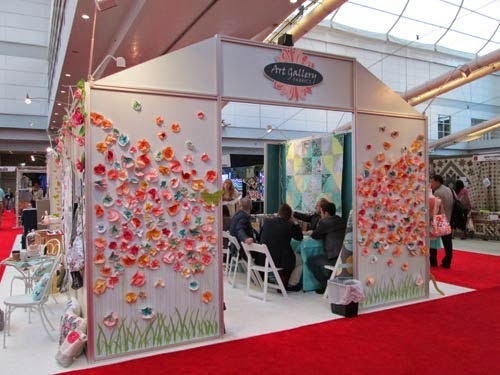 He’s done some neat dies for Sizzix that look like cathedral window and hexie designs. 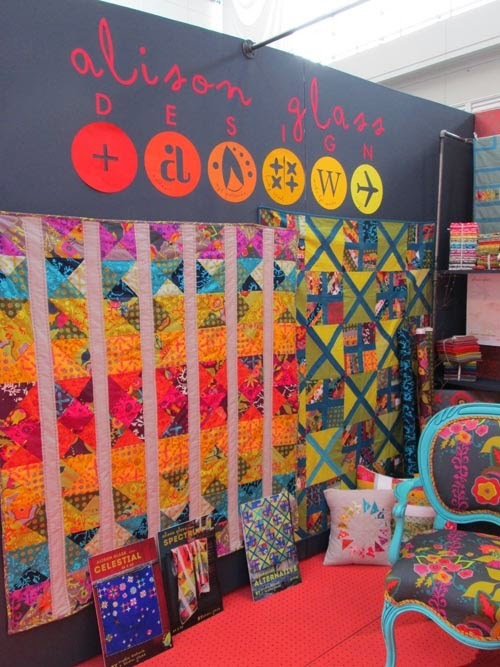 I took a lot of photos in Alison Glass’ booth, as it was beautifully designed and decorated with her quilts and her fabric collections for Andover. 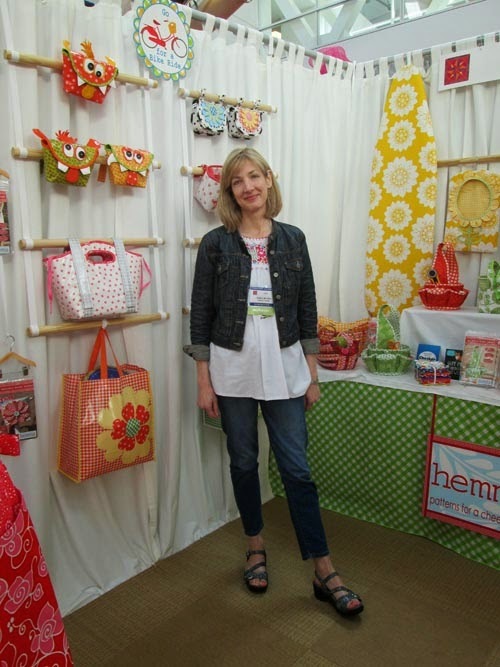 Kathy McGee of Hemma Design has a new line with Swedish influences by Red Rooster, and her booth had some darling projects made with oilcloth/laminated fabrics and three-dimensional elements. 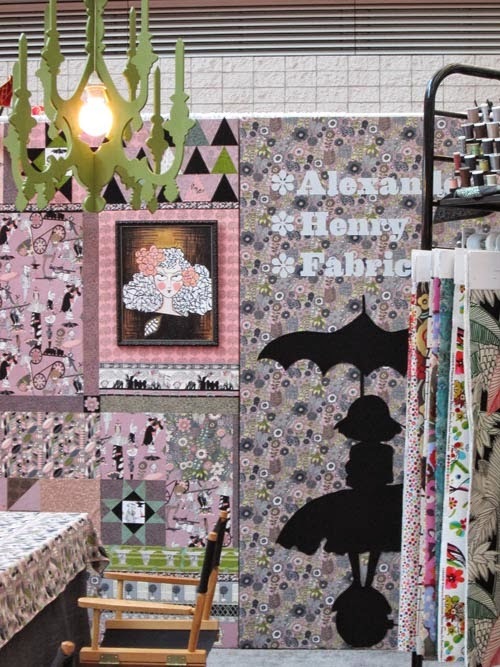 Art Gallery Fabrics’ booth was so fresh and springy! 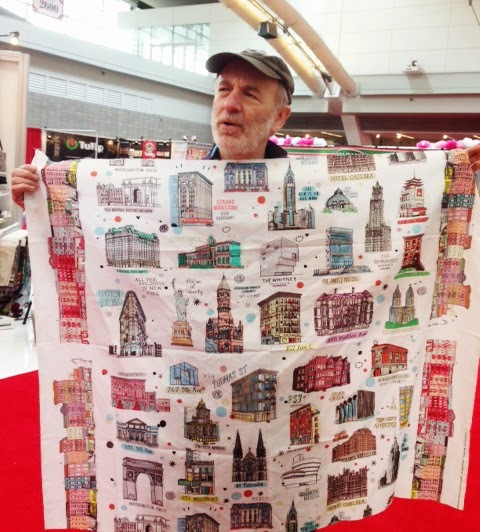 Dale Riehl of The City Quilter in New York City showed off their “All the Buildings in New York” fabric. Love it!